City dwellers and country folks alike are realizing the benefits of back yard homesteading. It doesn’t necessarily mean you have to go out and buy a horse, cows, goats and fill acres with fences and animals. Back yard homesteading could be as simple as a few chickens and a nice garden for summer time vegetables. Homesteading is simply making the best use out of the land you have to use. If you have a small city plot, plant a garden in addition to flowers for an edible landscape design. If city ordinances allow, add a few chickens for a fresh supply of eggs. Despite a common misconception, you do not need a rooster to have fresh eggs. You only need a rooster if you want fertile eggs! Chickens are an easy addition to the back yard homestead because they require very little maintenance. A clean source of water is a must and a constant supply of a healthy chicken crumble from your local feed store will have you enjoying fresh eggs in no time. A great benefit to chickens is the built in composting option. They LOVE table scraps, vegetable peels and cuttings and pretty much any food stuffs you’d normally throw away. In return they will give you fertilizer for your grass or garden. We coop our chickens at night and let them run free in the yard during the day. This does require fencing around any gardens, as I said, they do love fresh vegetables and you’ll find a patch full of half eaten cucumbers and the lettuce will be gone if you don’t lock them out. I clean out the chicken coop every month or so. I compost the straw bedding for the garden soil. We use five gallon buckets in a wooden rack that we built for nesting boxes. This keeps the skunks and racoons from stealing the eggs. The buckets are at a twenty degree tilt to keep the eggs from rolling out onto the ground. Please comment with any questions and as always… Happy Homesteading!!! This entry was posted in Gardening, Homesteading, Poultry on September 14, 2011 by Homesteader's Supply. Something to keep in mind when considering gardening with straw bales, make sure you purchase straw and not hay bales… hay will get too hot in the composting process and will kill your plants. You can plant either seeds or plants in straw bales. I sowed seeds and transplanted from four inch pots last year, but before you begin, you must begin the composting process. I arranged the dry bales (much easier to move when dry!) in the configuration that worked for our back yard. You can either lay them down on the side (strings on the top and bottom) or strings on the sides with the cut straw facing top and bottom. If strings are on the sides, like in the photos, they tend to be a bit wobbly so secure them to each other or stake them into the ground with rebar. I neglected to do this and had a few bales fall over. Once the bales are arranged properly for your space, soak them thoroughly and sprinkle each bale with one cup of either ammonium sulfate or ammonium nitrate (though the latter is difficult to find since it’s been used for terrorism). Soak the bales again and let rest for one day. On day two, sprinkle one quarter cup of the fertilizer on each bale and soak thoroughly again. Repeat for eight more days. On day eleven, stop using the fertilizer and just soak the bales well for another ten days. On day twenty one from setup, you’re ready to test and see if the bales have cooked enough. Is it HOT inside the bale? Warm is ok, hot means it’s still cooking and you should wait a few days before planting. Just continue to water each day and test again. Does it give enough (meaning is the straw still tight or has it composted enough) for you to get your hand inside the bale? If the bale is no longer hot and if there is give for your hand… then you’re ready to plant! What I do for seeds is work a couple of coffee cans of soil into the top of the bales and then poke the seeds into the soil based on planting depth. Once the seeds are in place you can lightly sprinkle soil on top of them and water carefully until they sprout. You can cover it with mulch if the spring temps are super high, but typically, as long as I keep it watered a few times a day to keep the seeds moist, they will sprout within a week. If you water too hard (high water pressure) your seeds will sprout from the ground around the bale, so be careful to soak the bales slowly as not to wash away your seeds. Now for the transplants, I use a pointed shovel and stick it into the bale and then pry it back creating a gap in the bale, I pour in soil from the coffee can and water so the soil is moist or even muddy. I remove the shovel once there is enough soil to keep the gap open. I then make a hold for the plant and add a bit of soil on top to make sure the roots are well covered. Again, mulch is optional depending on the weather. Water the bales twice daily if there isn’t rain and add compost tea if they look faded at all. I have used miracle grow with great results but some look for an organic option and composting teas are wonderful and nutrient rich. 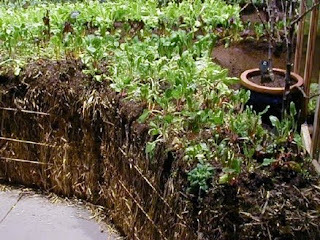 This entry was posted in Gardening, How-To, Straw Bale Gardening on September 10, 2011 by Homesteader's Supply.